This page shows the latest ranibizumab news and features for those working in and with pharma, biotech and healthcare. as Lucentis (ranibizumab) faces stiffer competition in the marketplace. will compete against Novartis’ already NICE-recommended Lucentis ( ranibizumab). Approximately 17 fully matching, plus 60 partially matching documents found. 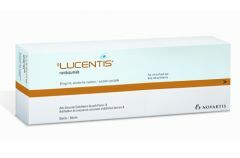 effectiveness over Novartis' Lucentis (ranibizumab) in the treatment of wet age-related macular degeneration (AMD).